We kick off the second season with Mike being summoned to dinner by Jessica. Understandable, Mike starts to panic that Jessica must know his secret and surely he will be fired. His wheels are spinning until Harvey lists the last five or six senior partners and explains to Mike that Jessica took them all out to dinner during their first year. After some hilarious Harvey-Mike banter, (including some great Goodfellas references) Mike finds himself fielding Jessica’s questions about what Harvard was like. We also learn that Mike’s parents were killed by a drunk driver when he was young and the grandmother we met in season one raised him (Rebecca Schull – or Fay the batty airline receptionist from Wings.) After dinner, back at Pearson Hardman, Jessica tells Harvey she sees why he thinks Mike is so special. His record at Harvard shows he graduated top of his class, but there is no record of him ever going college anywhere. She tells Harvey point blank – “Fire that goddamn kid.” Harvey knows he has to fire him, and he tries to do it, but he can’t. Jenny confronts Mike about his kiss with Rachel. She dumps him, tells him that Trevor told her about the kiss and that he was going to Jessica about Mike. Reprise: Smoke and Mirrors by Gotye as Mike slowly walks through the hallways of the firm. Donna and Rachel have a girl chat in the bathroom where Rachel admits drunk dialing Mike and that he hasn’t mentioned it in three days. They come to the conclusion that he must have heard the message but has chosen Jenny. Mike flips out on Harvey, Harvey tells him to stay calm even though it seems like it is all going to blow up. Donna cuts the tension by coming in and informing that Alicia Hardman has died. Jessica comes after Harvey after Louis tells her he has assigned work to Mike (another power play totally orchestrated by Harvey.) Harvey tells Jessica about Alicia’s death and we learn she was the wife of Daniel Hardman – the other half of Pearson Hardman. It seems that Jessica and Harvey ran him out of the firm five years ago when they threatened to tell his wife of the affair he was having. Jessica accuses Harvey that he is just trying to get the spotlight off Mike. Harvey disagrees. He thinks Daniel is coming back, they don’t have their leverage anymore, and Daniel is going to come straight for them. 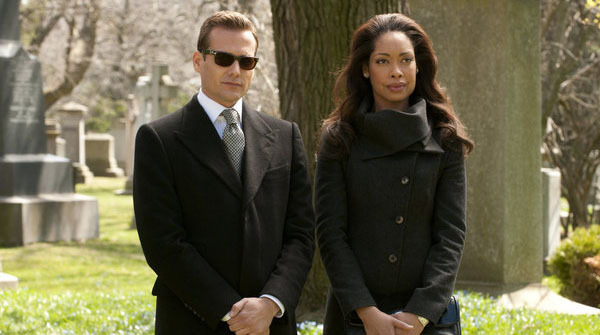 Cut to a graveyard, Harvey and Jessica in black. Harvey asks Daniel if he is coming back, to which Daniel replies he hasn’t thought about it. Daniel reassures them that he is a changed man. Neither Jessica or Harvey are buying that he has turned over a new leaf, and Harvey uses this to strike a deal with Jessica – if he stops Daniel from coming back, Mike gets to stay. Jessica agrees to it. Harvey goes to Daniel’s house and tells him that if he tries to return to Pearson Hardman he can be sure that his teenage daughter will find out all about her father and the kind of man he really is. It doesn’t work, and Daniel comes back, coming clean to everyone about his past including fraud he committed at the firm. Jessica tells Harvey she doesn’t ever want to see Mike again. Harvey says if Mike goes; he goes. Jessica tells Harvey to pack his things. Harvey reminds her that losing him with Daniel coming back is not the best move right now. The episode ends with Mike discovering Rachel’s voicemail and being summoned to the office by Harvey. When he gets there – it’s Jessica that’s waiting for him. She asks him how he got Harvey to hire him. Mike tells her to turn on the laptop and ask him anything about the law. She plays the game, but she says unlike Harvey, she doesn’t need the computer.